Lions Alan Beamer & Susan Beamer (Our Lions A-2 District Diabetes Chairs) met with the Diabetes Educators at the Welland Hospital Diabetes Clinic to see the IPads purchased by the Lions Clubs of our District, in use. "Nurses Rose (left) & Kim (right) showed us how they work with clients to plan meals, look up foods to be able to count their carbohydrates & sugars to keep their blood sugar in balance. There is also an app for children to use when they are at school to help inform teachers & other students about diabetes and what the student has to do to stay healthy. 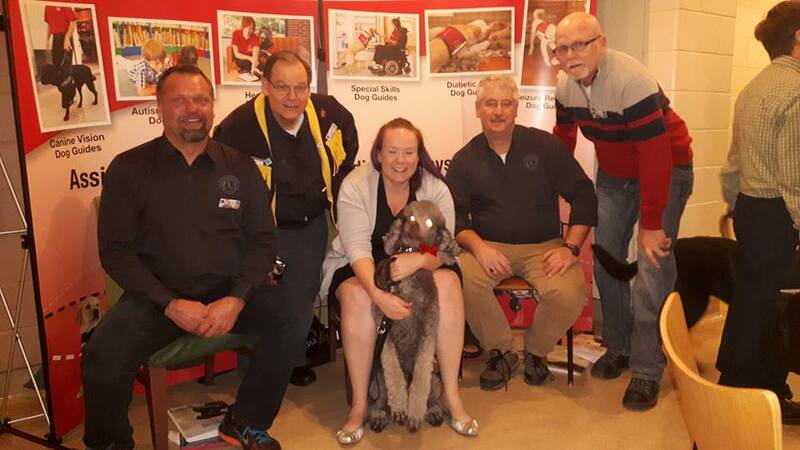 Members of the Fabulous Fenwick Lions were on hand to watch our Clubs 19th sponsored Dog Guide, graduate from the Lions Foundation of Canada Dog Guide School. Congratulations Michelle Woolfrey & Liscio! Liscio replaced Odin, our 18th sponsored guide dog who she was partnered with in 2017 had to be removed from Service due to medical reasons. Michelle is a young lady that became blind when 16 years of age & is attending Ryerson in Toronto & hopes to become a lawyer. Thanks to funds that were raised from last year’s Classic Car Raffle Michelle, has a new seeing eye dog. 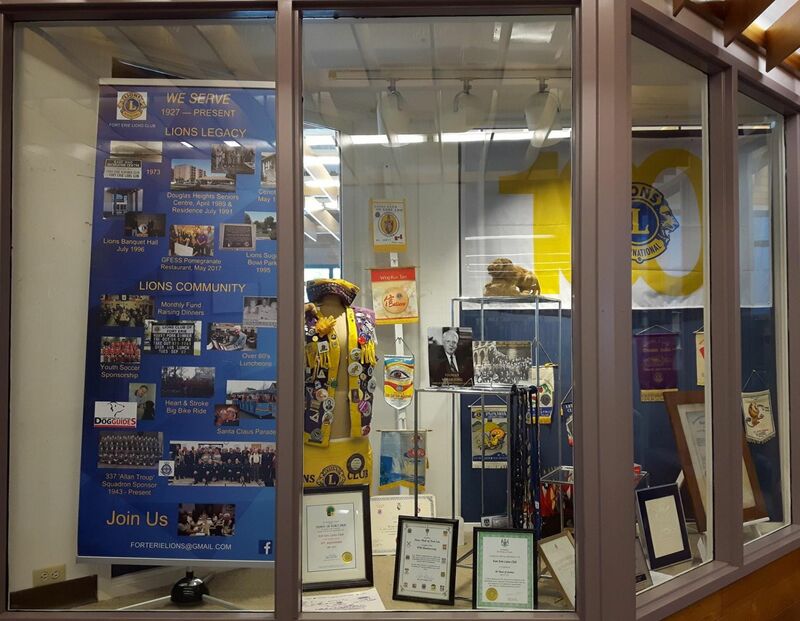 DELHI, ON - The Langton Lions are celebrating one of the most successful fundraising initiatives the service club has ever undertaken. 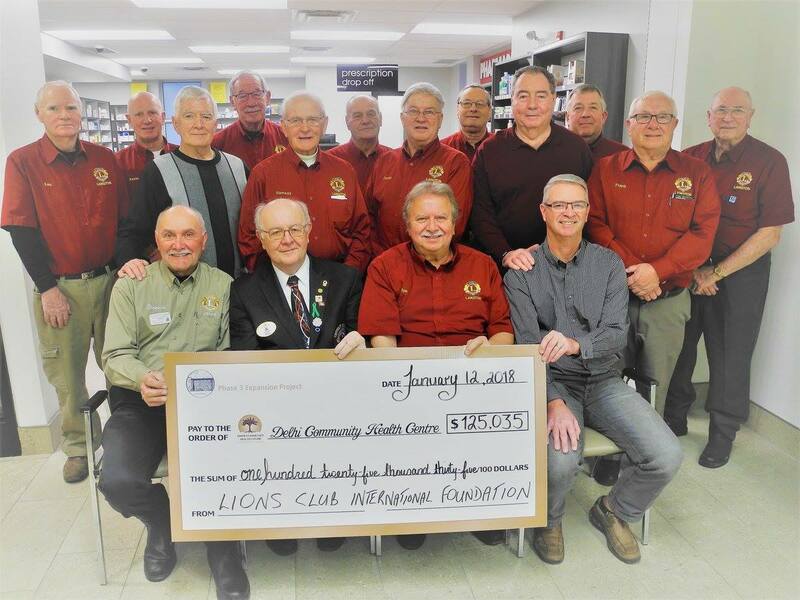 Since 2015, the Langton Lions have rallied support from Lions chapters in this part of Ontario for the Delhi Community Medical Centre. The medical centre has evolved into a regional health facility. Along the way, it has a made a significant dent in the doctor shortage that has been a chronic problem in Norfolk County for over 20 years. Lions clubs in the local area have been frequent, generous donors to the medical centre. In November, the Langton chapter was informed that Lions International of Chicago, Illinois, had agreed to provide a matching grant to the medical centre in the amount of US$100,000 (CDN$125,000). Langton Lion Frank DeDobbelaer, a past district governor of the Lions Club, undertook the local fundraising campaign with Dr. Colin Barnes of Delhi. They explained to 16 local Lions chapters why it was a good idea to support the Delhi facility. Meanwhile, DeDobbelaer had been trying to figure out how to tap into Lions International’s matching grant program for worthy causes. Several of DeDobbelaer’s applications for the Delhi medical centre were rejected before he figured out that the program was for medical equipment that was as-yet unpurchased. These rejections actually worked in his favour. Immediately before DeDobbelaer’s latest application, Lions International bumped up its maximum matching grant limit to US$100,000 from US$75,000. The Delhi Community Medical Centre is the first Lions International project funded at the new, higher level. “So far we’ve ordered $50,000 worth of desks and chairs,” says Dale Corner, chair of the Delhi Community Medical Centre’s board of directors. Securing the grant was truly a team effort. DeDobbelaer thanked Linda Vanlondersele, past executive director of the medical centre, and current executive director Bobby Jo Smith for the help they provided along the way. Also coming in for kudos was Dennis Craddock of Jarvis, the local representative of the Lions Club International Foundation. Craddock hand-delivered the successful application to Chicago on behalf of the Langton Lions. On Saturday, December 2nd the members of the Jarvis Lions Club, with the assistance of student volunteers, collected food donations by going door to door in the Town of Jarvis. Residents were asked to leave their non-perishable donations in a bag or box on their front door/porch/entryway before 10:00 AM that day. The collected food was delivered to the Jarvis Caring Cupboard Food Bank and will assist those in need over the holidays and throughout the year. 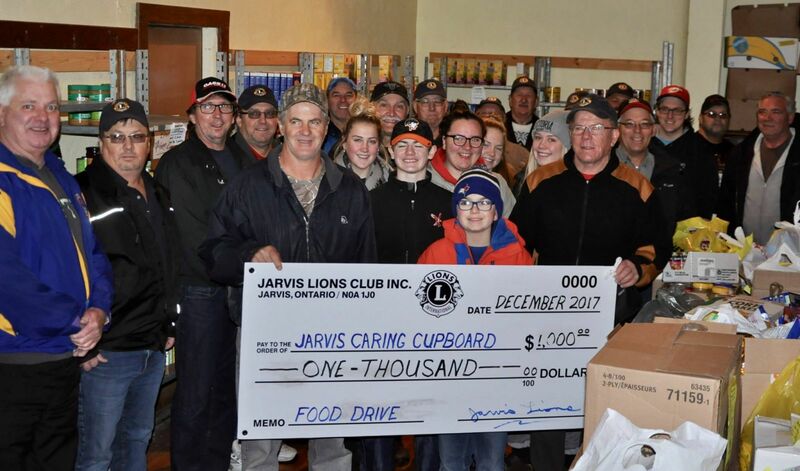 As well as collecting over 2 tons of food, the Jarvis Lions contributed $1,000.00 to help purchase other needed goods to re-stock the shelves. Pictured are some of the Lions members and student volunteers after making the delivery and presenting the Caring Cupboard with the $1,000.00 donation. If you happened to miss out on this day and still wish to make a food donation, please contact Lion Tony Southworth at 519-587-4289. Thank you to everyone who donated and helped out - your efforts will go a long way in helping out some of the residents in the Jarvis area. Merry Christmas!!! Every Friday between 4 and 5pm you will find the members of the Welland Lions Club hosting a Meat Draw at Handlebar Hanks. The patrons of this popular neighbourhood bar and eatery are big supporters of the Welland Lions fundraiser with all proceeds directed towards purchasing a Lions Foundation of Canada Guide Dog for someone in Niagara. 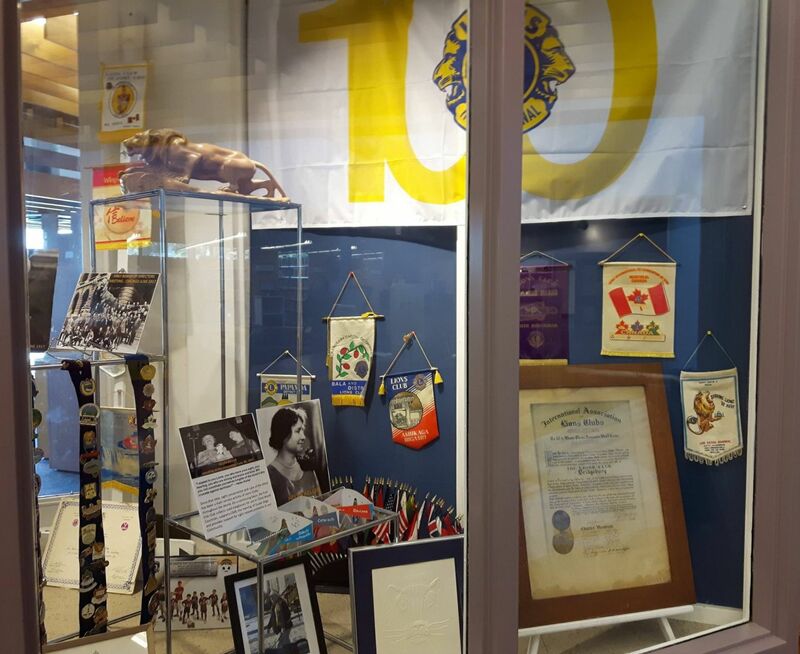 Lions Foundation of Canada is a national charitable foundation created by Lions Clubs across Canada. 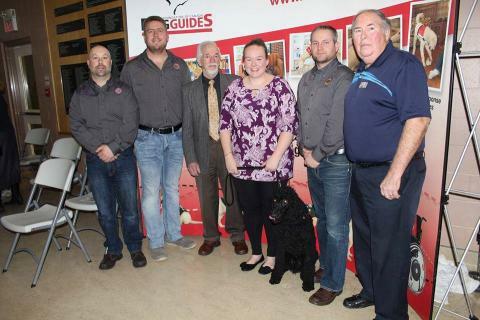 Its mission is to assist Canadians with a medical or physical disability by providing them Dog Guides at no cost. Since 1983, Lions Foundation of Canada has provided specially trained Dog Guides to people of all ages dealing with a number of conditions, including impaired vision, autism spectrum disorder, diabetes and seizure response. Each Dog Guide costs approximately $25,000 to raise and train. In 2011 the Welland Lions Club donated a seeing eye dog to St. Catharines teenager, Michaela Kinnear. 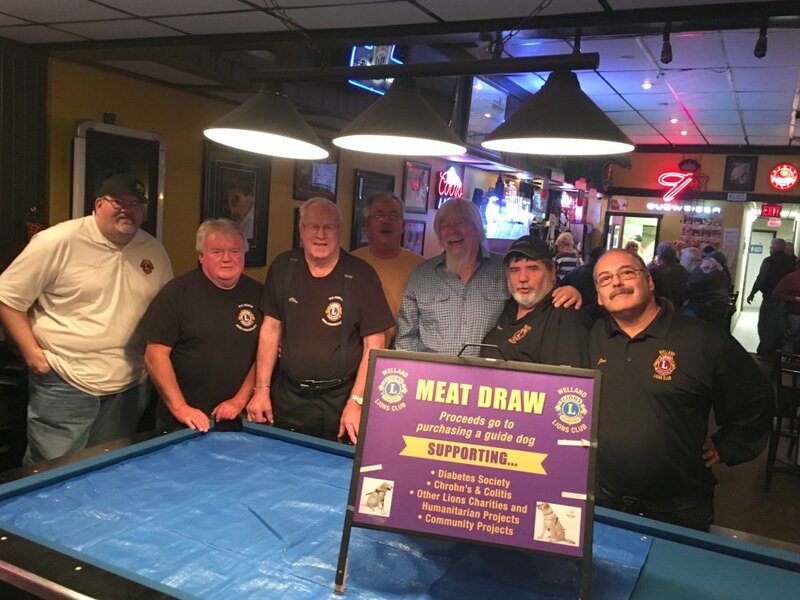 Thanks to their weekly Meat Draws the Club will be in a position to donate another service dog again next year. This past week the meat raffle included eight rounds of turkey draws and a bonus round of a wine gift basket. The turkeys were donated by local supermarket, Freshco in Welland. Next week there will be hams up for grabs courtesy of Country Corner Market. Welland Lions Members go from table to table selling the numbered paddles at a cost of $2.00 per chance to enter each round. This week there were 30 entries sold per round. Spend a toonie while helping a worthy cause and you may come home with a turkey or a ham or some stakes – who knows? You’ll have to stop by Handlebar Hanks, 30 Rice Rd at Thorold Rd, Welland on a Friday night and try your luck. 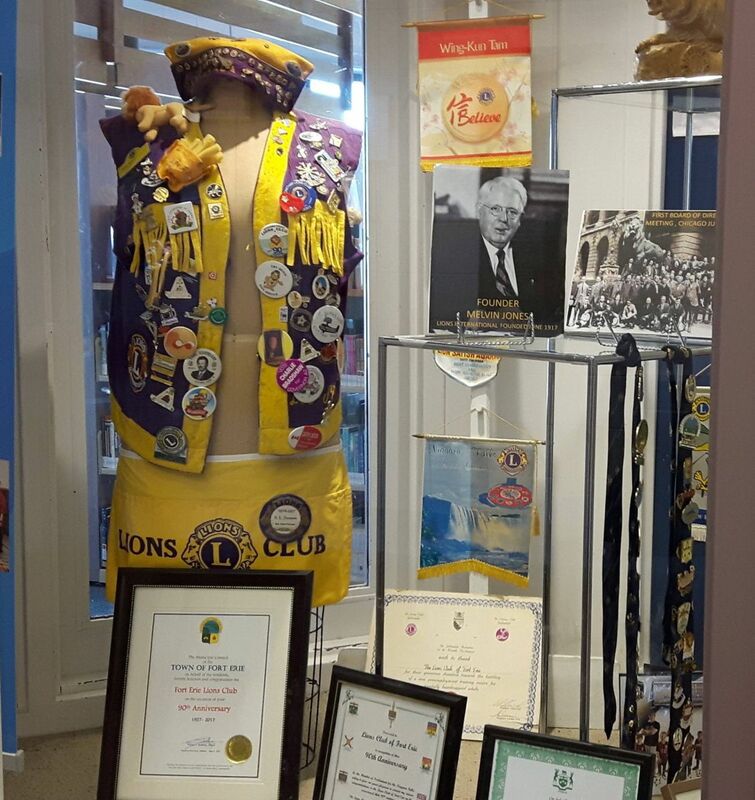 The Fort Erie Public Library is highlighting the 90th Anniversary of the Club's work in the community with a display of memorabilia at the Library. All members of Port Dover Lions Club attending the September 19 meeting took part in the $30,000 cheque presentation to NGH Foundation. In the forefront holding the big cheque are (left to right) draw chair Alan Strang (black shirt), President Joe Green, Kelly Fulsom, NGH Foundation member Jennifer White and Lion Past President John Hall. ALL the profit from Port Dover Lions Club’s Kia car draw that was awarded at the end of June was earmarked for Norfolk General Hospital Foundation’s Build a Better Hospital campaign. 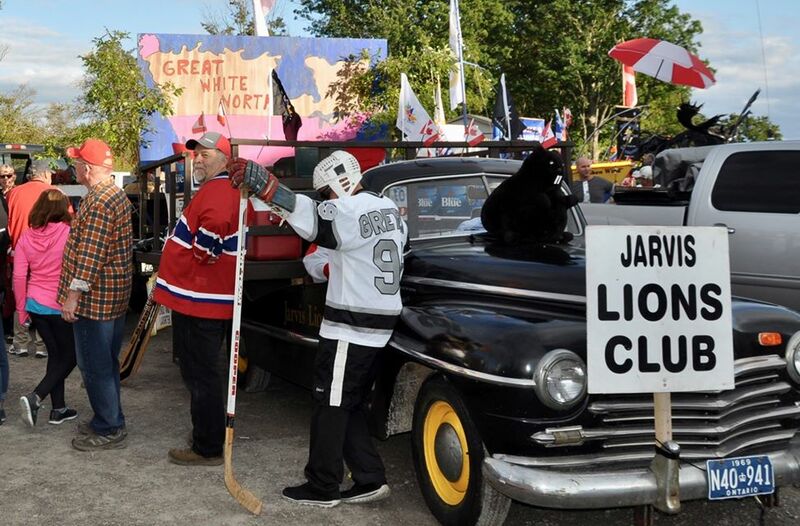 On Friday, September 8th the Jarvis Lions participated in "The Great Haldimand Trike Race" in Cayuga. We had a lot of fun and would like to thank Haldimand Motors for putting on this event every year and giving back to our communities in a huge way. See you there next year!!! Check it out! Fonthill Lion & Chair of A-2 District (Region 38) Lion Fred Arbour gets up close with the camera for his interview on CogecoTV Niagara. Congratulations to the Fonthill Lions Club on the incredible success of your inaugural #SLIDERFEST Who knew how crazy people could get about Sliders!! 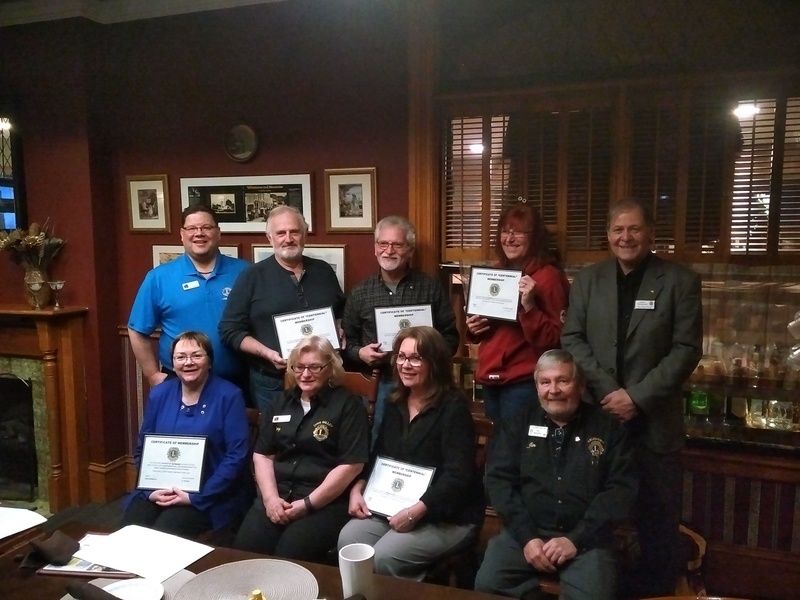 At our Dinner Meeting on April 5, 2017 the Fabulous Fenwick Lions inducted two new members into the Club. 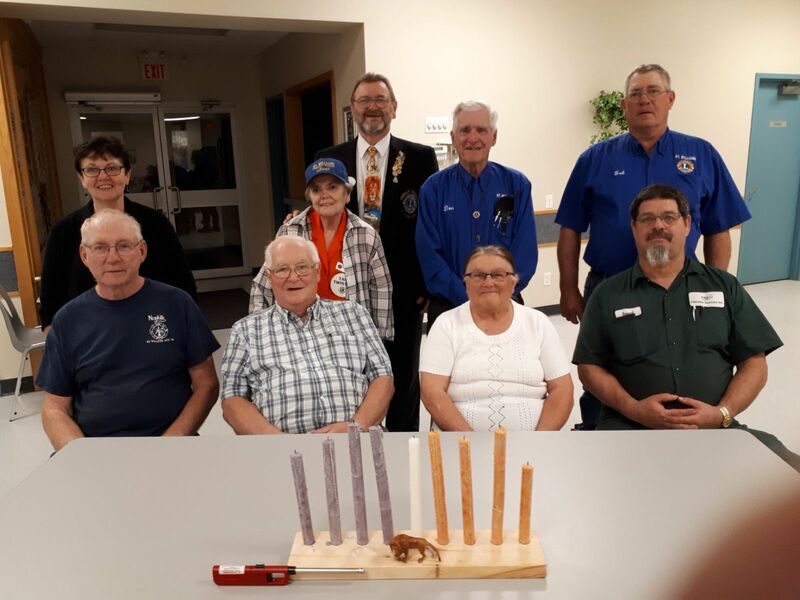 Lion John Haak, a member of our Twin Club in Evans New York & who is also 20N District Governor (New York & Bermuda) inducted the two new members. The two new members are our 11th & 12th new members in 2016-2017 Lions year. 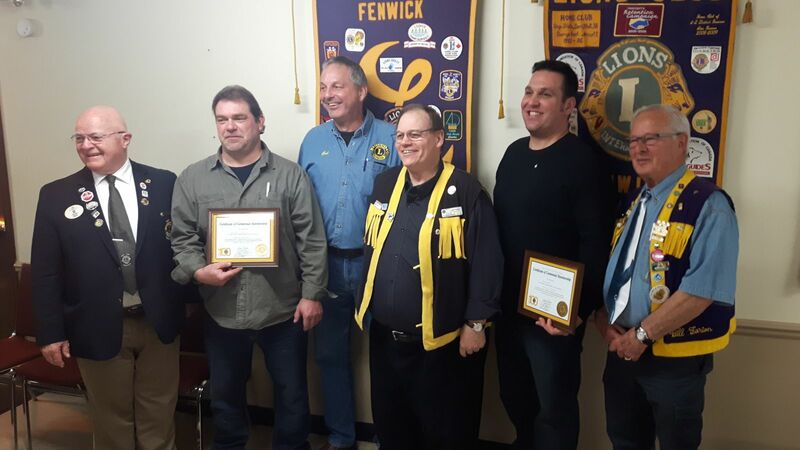 Photo L>R: DG 20N Lion John Haak, New Lion Mike Oshust & Sponsor Lion Bert Marissen, Lion President Jeff Pickup, new Lion Fred Sidler & sponsor Lion Bill Farion. 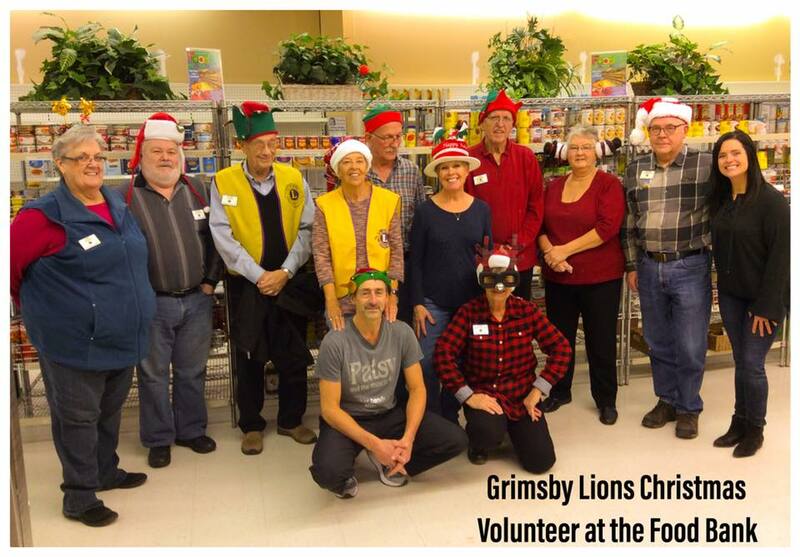 Lynn Vally Lions from Simcoe Ontario have increased its membership 44% in the last 9 months. An un-heard of instance took place where a new Lion to be who was inducted was also the sponsor fo two new Lions that were inducted in the same ceremony! The Fabulous Fenwick Lions inducted our 8th new Lion of the 2016-2017 Lions year at our Dinner Meeting on January 18, 2017. PDG Lion Al Beamer & 1st Vice District Governor Lion Jim Lomas did the induction. The Fabulous Fenwick Lions made their annual donation of $1,000 to Pelham Cares at our Dinner Meeting on January 18, 2017. Pelham Cares is our local Food Bank as well as providing Youth Services & Medical Drivers. The Fabulous Fenwick Lions also assist in their annual Food Drive on the first Saturday in December. On February 2, 2017 four members of the Fabulous Fenwick Lions attended the Lions Foundation of Canada Guide Dog School in Oakville to see our 14th Canine Vision Dog sponsored named “Odin” graduate. Odin has been partnered with Michelle Woolfrey, a young lady that lost her sight at 16 years of age. Odin is replacing her previous Canine Vision dog “Thompson” who is being retired. Michelle is currently attending Ryerson & hopes to become a lawyer. We hope Odin can assist her in achieving her goal. The Fabulous Fenwick Lions have also sponsored four Special Needs dogs as well. These 18 Guide Dogs have been sponsored from proceeds from our past Harley raffles & last year’s Wheels & Waves Boat raffle. Thanks to all Lions that have purchased tickets in these raffles. This year the Club is raffling a 1970 Chevelle Malibu appraised at $36,000 with proceeds going toward sponsoring our 19th Dog Guide. Tickets are $10 each & are available from any Fenwick Lion or online on our website Fabulousfenwicklions.org. 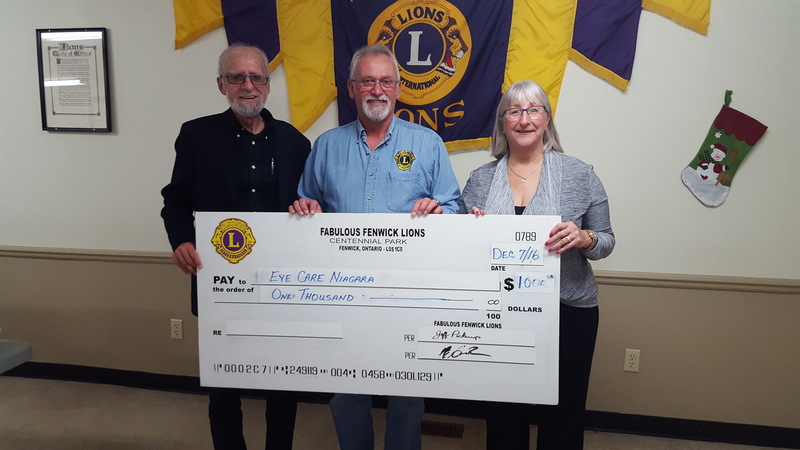 At the Fabulous Fenwick Lions December 7, 2016 Dinner Meeting Lion Ken Suthons presented a $1.000 cheque to Lions Eye Care Niagara. This donation was to go toward Lions Eye Care Niagara’s commitment to the OneFoundation for Niagara Health Services of raising $200,000 over the next five years to pay for the new Ophthalmology Microscope now in use at the Welland Hospital Site. Accepting from Lion Ken is Lion Glenn Connell of Lions Eye Care Niagara & Mary Sergenese of OneFoundation for Niagara Health Services. The Fonthill Lions Club was honoured to present Sharon Crowe and her daughter Alanna with a cheque in the amount of $1,560.00 to help support the ongoing costs associated with their daughter/sister, Faith Flagg’s medical care. 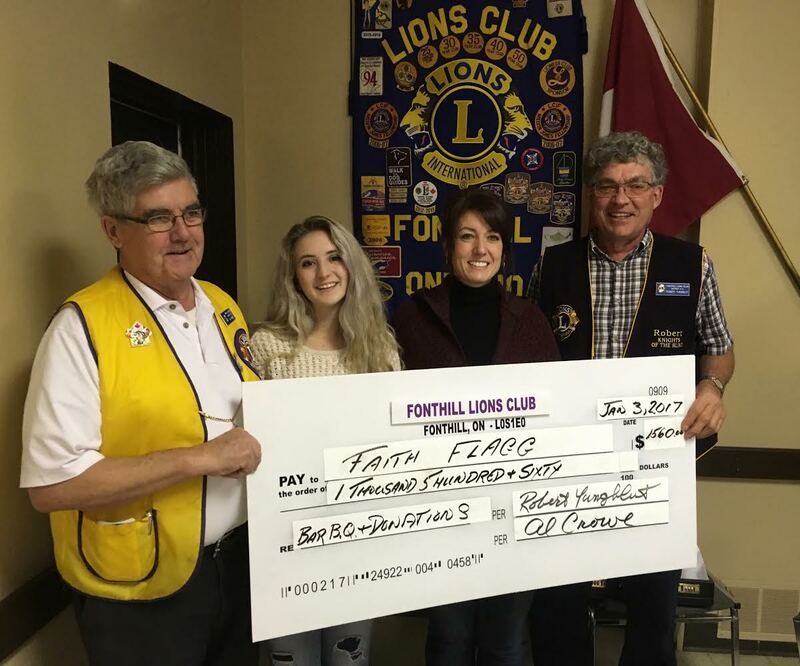 The donation included the proceeds from BBQ Fundraiser we hosted at E. L. Crossley Secondary School in December as well as contributions from our Fonthill Lioness. As Sharon expressed her thanks for the donation she commented, "I can't tell you how much this means to us, even after more than a year has gone by - our struggle continues on a daily basis." On April 3, 2015, at the age of 18, Faith Flagg suffered a serious brain injury, when she was struck by a hit and run driver while walking with friends along Canboro Rd. between Church Hill and Haist St. in Fonthill. 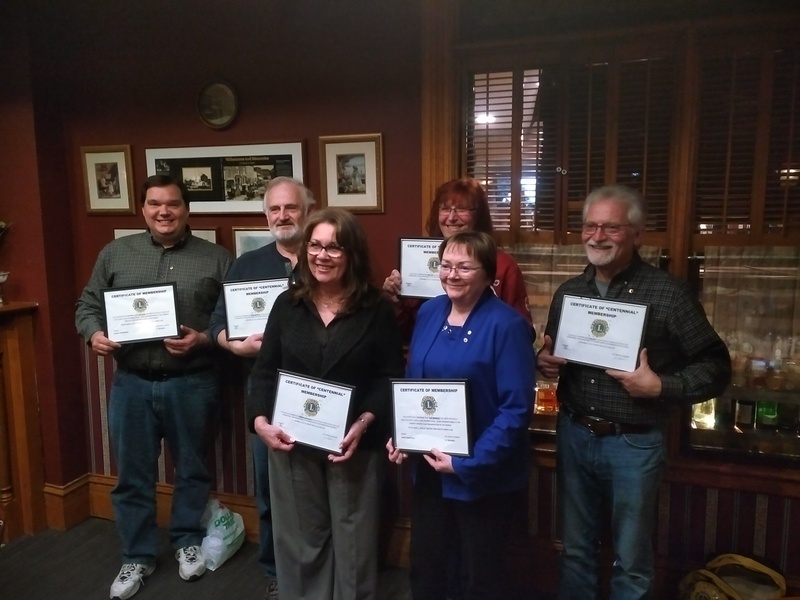 The Fonthill Lions Club kicked off the New Year by we welcoming 2 new members: Lion Gerry Glaves and Lion Cathy Berkhout-Bosse; Region Chair Lion Zoltan Dohar was on hand to induct the new members. Gerry Glaves is the Funeral Director at Pleasantview Funeral Home & Cemetery and has joined our Club to become more involved in our local community. Cathy Berkhout-Bosse, Real Estate Broker at Remax Welland Realty Ltd. is the second female lion to join our club. She was sponsored in by her father, Gerry Berkhout who celebrates his 50th year as a Lion this year. The Father-Daughter Lion team is a first for the Fonthill Club but a new growing trend among Lions International. 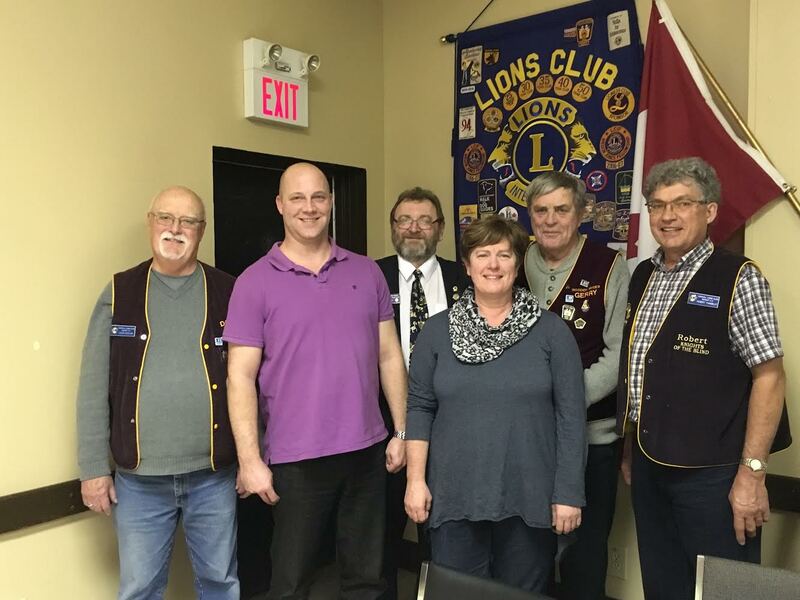 Pictured L-R Sponsor Lion Doug Gaylor, sponsor of New Lion Gerry Glaves, Lion Zolton Dohar, New Lion Cathy Berkhout-Bosse with her Sponsor Lion Gerry Berkhout, and our Club President, Lion Robert Yungblut. Fabulous Fenwick Lion President Jeff Pickup presents a cheque for $7,500 to Emilia Froom from the Lions Foundation of Canada Guide Dogs. Future Guide Dog Morris who Emilia fostered looks on. The donation was made from the proceeds of our Wheels & Waves boat raffle this fall. $6000.00 is to sponsor a Canine Vision Dog & $1,500 is toward our 38E Zone Chair Lion Holly Cavanaugh’s project of raising $12,000 for an Autism Assistance Guide Dog. In the past 13 years the Fabulous Fenwick Lions have sponsored 13 Canine Vision Guide Dogs at $6,000 each & 4 Special Needs Guide Dogs at $10,000 each. 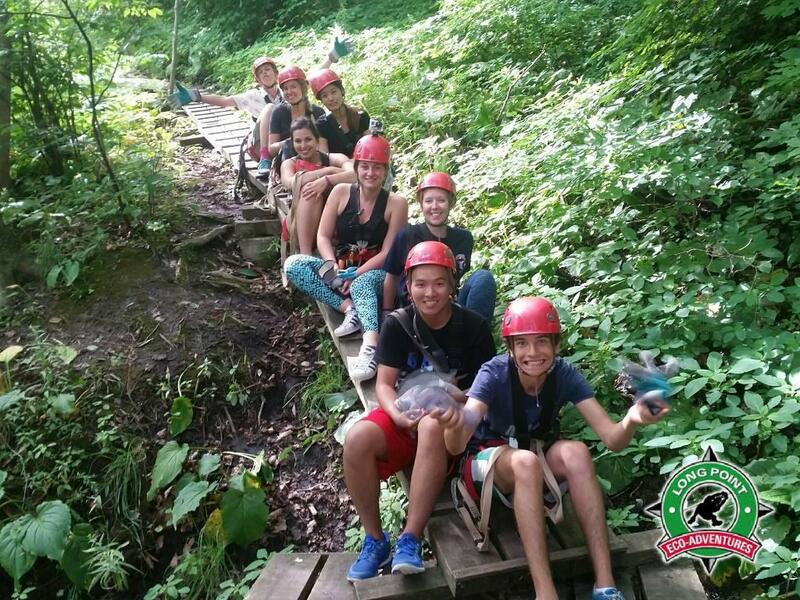 A-2 Lions Youth Exchange Zipline Photos - Click Photo for more!